If you check around, you should find that people with myopia usually have remarkably poorer visualization skills than people with normal vision. Their visual memories tend to be lacking, and the ability to recall those memories is also lacking. The exceptions to this rule thankfully have at least one component of good vision working, so they are in a better position than others. For the rest of you, it will require some work to get your ability up to speed. Yes, I understand if you can hardly visualize anything, and even then only a vague impression with no details. You can still work with that limited ability, improving it in order to improve your ability to actually see details. What is important here is not what you visualize but how you do it. It doesn’t really seem to matter much what objects or people or places you visualize, so long as it’s something that keeps you interested enough and that doesn’t put you in a bad mood. So here we go. Pick something, anything. Say it’s a soccer ball. Immediately upon reading the words “soccer ball”, did a vague impression of a soccer ball flash through your mind? If it didn’t the first time, I bet it did as I suggested that, right? The place where it appeared is where you visualize. If you do this with your eyes closed, the image does NOT appear overlaid onto the dark field of nothing that you “see” on the inside of your eyelids. If you try to put it there, you will just start straining your eyes, as the point here is not to see it, but to bring up the image elsewhere in your mind. Try imagining the image appearing not in front of your eyes, but somewhere in the back of your head. That will help take the pressure off your eyes and get the correct part of your visual system to work on it. If nothing much comes up right away, that doesn’t mean you’re doing it wrong. It may mean you are just unpracticed and need to keep thinking of the object and waiting for an image to appear. You can do this with your eyes closed or open, whatever is easier. There isn’t a whole lot of complexity to this. The above instructions are basically all I have for you as far as how to practice visualization. If you have trouble, have you at any time recently had an image flash in your mind while you were daydreaming, or had a vivid dream? If so, that just proves that you are able to visualize just fine, but something is preventing you from doing so easily. Find some place alone where you can relax as much as you can, without falling asleep, and see what you can do. The basic principle behind developing and keeping visualization ability is “use it or lose it”, like most functions of our bodies. Use it as often as you can, and it will get better. Throughout the day if you have nothing interesting to look at, visualize something that you like or that will help you solve a problem. Even if you consider yourself detail-oriented, are you detail-oriented when it comes to your eyesight? When meeting another person, do you look at all sorts of details on the person’s face, or do you just take in their face as a whole without really noting many specific things such as eye color, wrinkles, hair, their facial expression, and other features? Visualizing is recalling one or more memories from things you have seen and exploring them with your intent to let your mind form a coherent image. Part of seeing well is noticing what you’re looking at and using your memories to aid you. Your memories help form coherent images in your mind where you understand quickly what you’re looking at because you’ve seen it before, and it fills in the gaps so you don’t have to examine every one of a billion little details. Most of what you think you see you actually are visualizing. If you can’t visualize well, as you look at things your vision will be clunky. You may think that the problem is your eyes, but your eyes’ main fault may be that they are trying to work in a poorly operating system and are unable to pick up the slack from your memory that isn’t doing its job very well. Under that kind of strain, it’s easy to imagine that your eyes will not do their job well, leading to defocus. So as this illustrates, your visualization ability is important for smooth and easy functioning of your visual system. Consider: What’s the first thing you do with everything else in your life if it isn’t the way you want it? The first thing you do, and the most important, is you visualize what it is you want it to be! If you don’t see the details you want to see, just imagine you do. 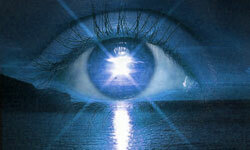 Visualize it in your mind’s eye, and look for confirmation that what you’re visualizing is there. Visualize another detail, and glance around for it. Repeat. Once you get some sort of visualization ability under control, even if it’s vague or comes in brief flashes, the best way to use it is to visualize the very thing your eyes are looking at. As you do that you can avoid straining your eyes as you direct more responsibility to the right part of your mind.